On Saturday, April 7th, I took my first kendo ranking test–1kyu–and I passed. It was one of the most terrifying and nerve wracking things I have done in a long time. I felt so out of my element. I was putting myself far, far out of my comfort zone. Kumamoto is known within the Kendo world as being a great place to study the practice. So many great high schools here who have won many national championships; so many individuals here who have one championships as well. Kumamoto is the very city where Miyamoto Musashi lived a good portion of his life and wrote The Book of Five Rings. The teaching here is strict and even the test, which varies from prefecture to prefecture, is a little different than other places where things are usually the same. I have been to Miyamoto Musashi’s grave and I have been to the very place he meditated and wrote his book–all here in Kumamoto City. The day of my 1kyu test came about and I was a nervous wreck. Heck, the day before I was nervous. I understand that it may not be a good reason, but I was to be the only foreigner there at the testing–and I didn’t want to be the only foreigner. The moment I arrived on the day of the test and made my way down to the floor anyone who was able to see me on my way stopped in surprise, some even stopped whatever conversation they were having and just stared in surprise. Being the only foreigner there kind of puts a lot of pressure on you. People want to see how you do and are curious of how you do it. I was nervous. Very nervous. I wanted to do well, and I made many mistakes, but I passed. The first part of the test had something called kirikaeshi which we had to perform twice, after that was something called uchikomi where the other person opens up specific hits on their body and the other is supposed to properly go for those openings and hit them. After those two things you recenter yourself and you start the shiai (match). In 1kyu it doesn’t matter who wins or loses. You just want to attempt to properly make cuts and hold your ground with good form. If you pass that portion of the test you are allowed to move on to the second part of the test: the kihon kendo kata. In this portion of the test you are placed up against another person and perform specific kata. There are two sides to these techniques. One person is motodachi (loser) and the other is kakarite (winner). I got lucky in that sense because I ended up being motodachi. Motodachi actually started off being the hardest one out of the kata for me to learn, but in the end became the easiest. I performed my kata without any mistakes and that felt great. The process was long. I was able to enter the budokan at 8am, things started around 9am and I sat around waiting to go on for almost three hours. I was #81 of 82 people! All in all, I finished around 2:30pm. My teacher was there watching, which made me even more nervous, but I tried. After the last part of the test was finished and while everyone was waiting for the results my teacher congratulated me on passing shodan before the results had even been posted. After everything was said and done Kevin, Yuji and I went and got ramen and followed up with some ice cream to celebrate. It was a good day and I was very glad when it was over. My teacher is already pushing towards shodan which is in a month. I am already afraid, but if I really do intend to do shodan I will have to push myself harder and harder. Evil/Demons out! Good luck, in! Last week was 節分 (setsubun). It’s a tradition held every year on February 3rd, the day before Spring, according to the lunar calendar. Now-a-days families will have someone (usually the person who was born in the current zodiac year: e.g. It’s the year of the dragon this year, so someone born in the year of the dragon should play the demon) put on a demon mask and the children will throw soy beans at them yelling “oni wa soto, fuku wa uchi!” This is done to cleanse the house of any evil that may have been hiding within your home over the winter months. The ritual of throwing soy beans is called mamemaki. During this day of work I had one student come in wearing a demon mask with a bag of peanuts. Now, it wasn’t the time or place to take part in Setsubun, but among kids it’s pretty popular and it looks fairly fun. Along with throwing soybeans out of windows and doors chanting “Oni wa soto! Fuku wa uchi!” people also eat something called makizushi (which is an uncut sushi roll) which they call eho-maki. It means “lucky direction roll”. When eating an eho-maki on Setsubun (well, it’s really the only time you’re able to buy one) you do so in silence while facing the “yearly lucky compass direction” determined by the zodiac symbol of the current year. Some people put sardine heads and holly leaves on their door entrances to ward off any bad spirits. Apparently even ghosts cannot stand sardine heads and holly leaves. I honestly didn’t have the pleasure of seeing any sardine heads or holly leaves above doorways but I suppose it doesn’t mean people don’t do it. On the left: Noboru, Keiko, and ME! 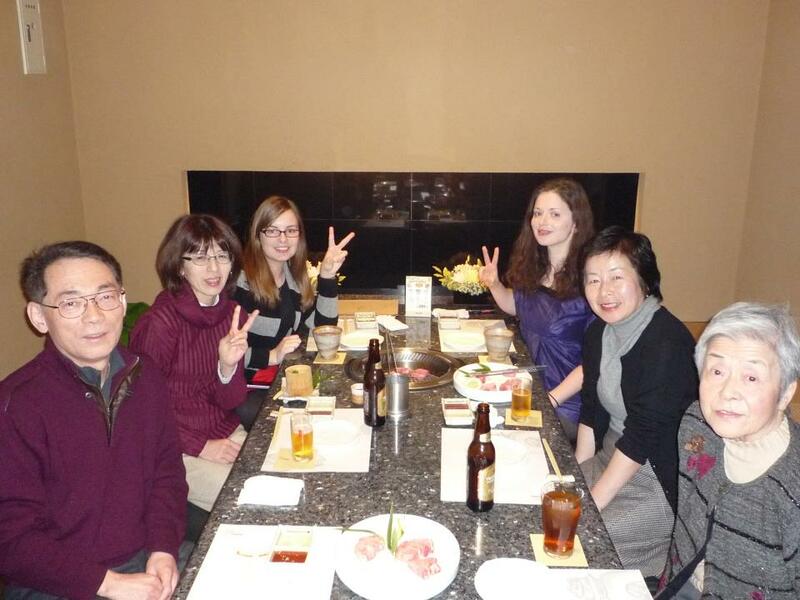 On the right: obaachan, Misako, and Naomi! All in all it was a good weekend. I even practiced kendo again for about two hours. It was a lot of fun. This time I was able to get into hitting things. I learned how to hit the head (men) and the arm/wrist (kote). My problem seems to be in yelling. I have a hard time screaming at the top of my lungs and yelling MEN or KOTE depending on what I strike. That and it can be a little embarrassing. I was a rowdy, loud kid when I was younger but as I got older I became quieter. Many people ask me to repeat things when we’re just chatting because I talk quietly. I wouldn’t say I mumble at all, but I can be pretty quiet. Here is basically what I did my last session. I didn’t strike my teacher’s kote or torso. I mainly focused on the men (head strike). But that sort of yelling is what you are supposed to do. It’s safe to say afterward my throat feels pretty raw. Pretty much how I trained today--in front of a mirror. Today I had kendo training. This time it was with an actual kendo sensei and also with a friend of mine who I met on my trek up (technically it was down) 3,333 stairs to a very old temple. It was a lot of fun and very difficult. There was a lot of multitasking; but unlike the multitasking I am used to it was much more physically challenging. There are so many things to pay attention to when it comes to the basics of kendo. 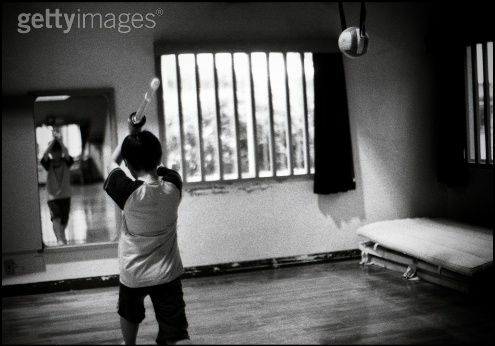 Your feet positioning, how you move your feet, how quickly you move one foot compared to the other, where your center is, making sure you’re moving your hips correctly along with the movement of your body, how you strike with your shinai (bamboo sword) and how you hold the sword in your hands. All of this must be done correctly otherwise you will begin to create habits–bad habits–that will be hard to break. Full kendo gear. The armor is called "bogu". I don't have that yet. Today was difficult for me. As I was training the basics–the foundation of learning kendo–in the background were high school students sparring and practicing and one couldn’t help but notice that they were way out of my league in terms of skill. But honestly, are you surprised? Most of them begin training at a young age and just continue on through high school. The crack of the shinai, the bellowing yells to express their ki, the quick and fluid motions that look almost effortless as they move to block a hit… it made me covet their skill. Sure, they aren’t 8dan or even close to it, I’m sure. But they have skill and they have the spirit… and I’m still finding it hard to do all the things I stated above and still yell out as I do them each time I swing my sword. However, I am lucky. My sensei is a 7dan. The highest is supposedly 8dan. He tells me it will take years before he is able to test for it and the tests one must go through for it sound excruciating. 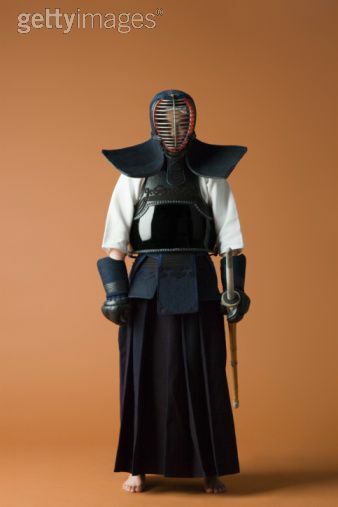 The levels of kendo are on a 1-8dan system. To teach kendo legally you must be at least a 5dan; but if you want to have your own dojo or lead one you must be at least 7dan. I am told if I work hard I can probably achieve 1kyu which is one of the few levels that exist before one can get 1dan. As an example, it could take about 2 years just to get 1dan… pretty long time.